The first Spider-Man film directed by Sam Raimi tells the story of how Peter Parker became the title hero. The personalities and motivations of the characters are introduced and it is a great introduction for non-readers to the character. It is a good film, but Spider-Man 2 is a fantastic film because it takes what is established in the first one and builds upon it. New plot points are introduced, old ones are used to enhance the story, and it combines several comic arcs into one film to create the greatest superhero film of all time. 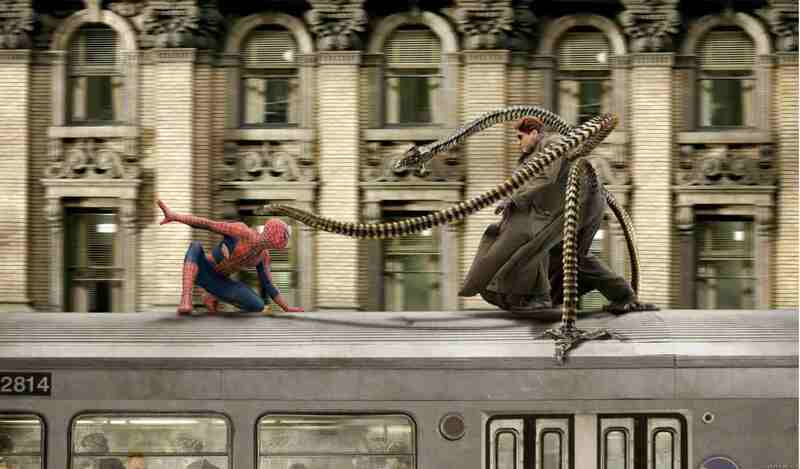 Because it’s a superhero film, director Sam Raimi creates great spectacles of action filmmaking throughout. More importantly, it’s a movie with a surprising amount of depth for a film about a guy who sticks to walls and fights a villain with eight limbs. Being a summer movie, the film opens with a fun sequence that advances the story from the first film. We see Peter struggling with his double life as he’s trying to hold a steady job delivering pizzas. He dons the costume and swings around the city in order to meet a 29 minute deadline. Given Peter’s history of bad luck, he fails and gets fired. From here, we see even more of his struggles. He can’t pay his rent, he can’t be on time for class and he has a strained relationship with both “girlfriend” MJ and best friend Harry. Like any good sequel, elements from the original film are used as building blocks to advance the narrative. While everyone from the original returns in some capacity, there is one major addition to the cast. Alfred Molina plays Dr. Otto Octavius, a scientist sponsored by Oscorp to create a device for sustainable energy. While he could have easily been portrayed as nothing more than a scientist, Raimi chooses to give him dimension. He’s a humble scientist with no aspirations for wealth or power. We get a good five minutes between just him and Peter at his apartment where they discuss both science and their love lives. This works great because we actually feel for him when his public demonstration goes array and the mechanical tentacles utilized in the experiment are bonded to his skeleton. He then goes insane and tries to build the experiment again but on a larger scale, leaving it up to Spider-Man to save him while dealing with issues of his own. The issues that I had with the first film are all rectified through the course of Spider-Man 2. Specifically, the characterizations of Peter, Mary Jane and the generic villain plot of the Green Goblin. My biggest criticism of the first film that I have always felt, is that Peter wasn’t proactive enough. It seems like he donned the suit solely out of guilt. He also looked like a murderer when the burglar who killed his Uncle Ben ambiguously fell out the window. 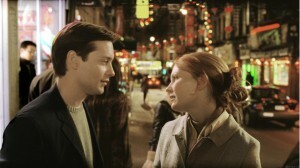 In Spider-Man 2, he takes more initiative in his duties and McGuire seems more comfortable in the role. Mary Jane has more personality in this film and the chemistry between the two leads is much better. Their relationship is not a typical cookie cutter romance. Both have to learn to communicate better and face adversity without simply moping about. The theme of the film is sacrifice. This theme is not solely for Octavius who makes the ultimate sacrifice, but for the other main three characters as well. Each undergoes an arc that involves sacrifice in some manner with the aid of a voice of reason guiding them. Peter has Aunt May, MJ has her fiancé John, Octavius has Peter and Harry also has Peter. For Peter, he has to learn to sacrifice his own personal happiness for the greater good of protecting New York. Mary Jane sacrifices her desire for fame and a peaceful life by choosing to stay with Peter despite the dangers that would arise from being Spider-Man’s girlfriend. She, like Peter, becomes entirely proactive by the end of the film, completing a two film arc that would carry over into the divisive third installment. While these three finish their arcs by the end of the film, Harry Osborn is the one character whose resolution is pending. 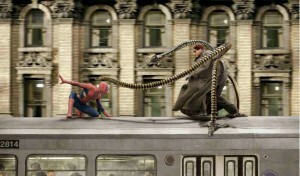 At the start of the film, he maintains a grudge against Spider-Man for presumably killing his father. This eventually leads to a dissolution of his friendship with Peter when he learns the identity of Spider-Man. His obsession with Spider-Man leads to the sacrifice of his sanity, displayed when he hallucinates seeing his dead father. His story ends on a cliffhanger but on a note that comic book fans could see coming. While this is certainly not as dark thematically or aesthetically as Batman Begins for example, there are many instances of brilliant comic relief. 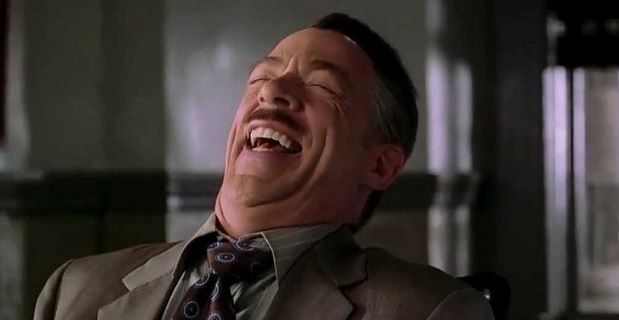 Jonah Jameson is even funnier in this film and when he learns Spider-Man gave up, he is first proud he was right but comes around and realizes that he was actually a hero. It’s hilarious the way he turns around and instantly returns to reviling him again when Peter steals the costume he hung in his office. Aunt May is a vibrant presence and she even gets involved in a thrilling action sequence when Peter is fighting Octavius. Spider-Man’s famous witty personality from the comics is present in this film. He spews out one-liners and has a humorous exchange with a group of kids who witness him jump over a taxi. For me, Spider-Man 2 is the standard for comic book films. It’s also the reason why I am no longer excited about seeing Spider-Man on screen (aside from the horrid Amazing Spider-Man films). Raimi maintains the essentials he perfected in his first film such as the mood and character portrayals but improves in other fields. The action scenes blend seamlessly with the CGI and the story takes more chances. For those who have never touched a comic book, this film serves as an excellent encapsulation of the best elements of Spider-Man in a brisk paced two hours. For big fans of the wall-crawler such as myself, it is everything that you could want in a superhero movie without being a simple retread of past comic book films.